Beautifully designed, styled and furnished 2 bedroom double floor house which can be described as, quite literally, heavenly. Every single photo will reveal that this residence was not just developed for practical purposes. An inspiring mix of materials is what makes this place stand out. The house has spacious atmosphere, high ceilings and full of details. With large windows bringing a large amount of natural light inside every room of the house and framing park views. Plenty of seating room for having the entire family over, the living area has a unique personality. And so do all its interiors, perfectly blending together coziness with an elegant modern touch. 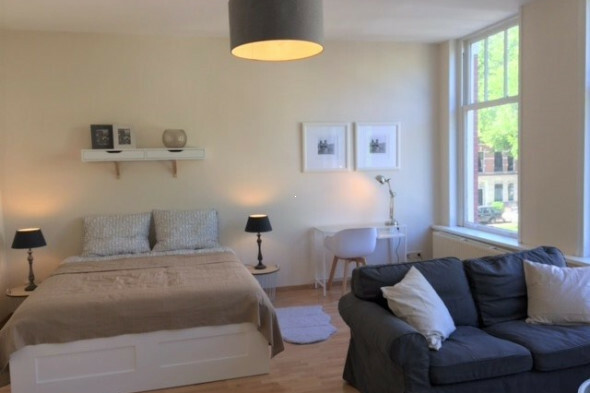 The first floor accommodates the living room, study room/ bedroom, dining area and the kitchen, the rest of the rooms being located at the upper floor. The living room, the kitchen and the dining area are not separated by walls. Therefore, the spacious living space looks unitary. 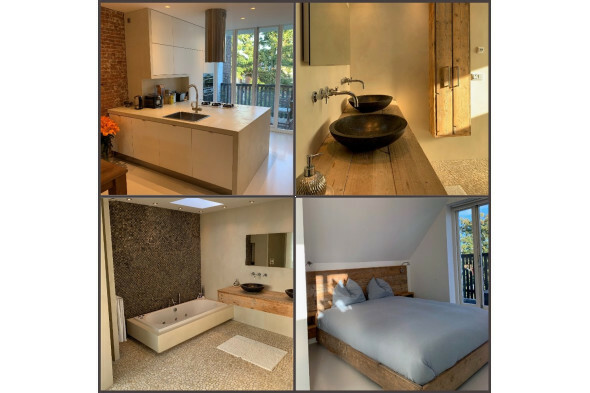 The upper floor accommodates the master bedroom and a luxury bathroom including with roof light in order to relate with the outside. As you explore the house, you bump into ceiling windows and rectangular cut outs, welcoming the maze of greenery. Be amazed by the attention to detail, as no expense was spared in its making. Even the location is in one word ideal. The apartment is nearby the Kralingse Bos. Very convenient accommodation for employees that work in Rivium or need easy access to the highway. One minute you could be relaxing in the park, the next you could be wandering in the adjacent streets with plenty of shops. There’s something about this place that can’t be really put into words, but it can be felt, as soon as you explore and experience it.